Setting up a nursery is an exciting part of preparing for a new baby, but being restricted to a powder pink or blue palette can also make it something of a frustrating endeavor. Whether you don’t know (or don’t want to know) the gender of your baby in advance, you want to create a gender-neutral space regardless, or if you’d simply rather not deck a room out in traditional baby pastels, it can start to feel like your options are a little limited. The good news? Gray nurseries are perfectly gender neutral, pastel free, and a little friendlier to adult sensibilities (while still looking great for baby). Gray has been showing up a lot in popular palettes for just about every room in the home recently, in large part because it’s a color so perfectly neutral that it looks great in almost any space. It has a little more personality than a generic beige or off white, but is soft (and “pastel”) enough to fit right in in a nursery. Layering different gray tones throughout your space can also add visual interest and a sense of variety without ever breaking from a neutral color scheme. One of the other big advantages of designing a nursery with a baseline gray color scheme is that gray is incredibly easy to accessorize. Gray looks great with pastels (whether it’s with another gender neutral color like yellow or green, or pink or blue if you decide later that you do want a more gendered color scheme), but also with just about any other color, if you want to age-up the room with your child, or even re-purpose it once they outgrow the space. If all your big ticket items are gray, updating your color scheme is as simple as swapping out an area rug and a few accessories. 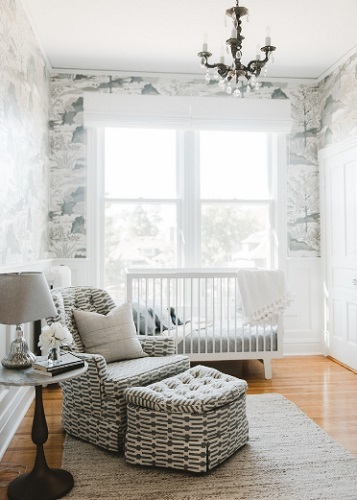 Sticking to a grayscale color scheme for your nursery also gives you a little more freedom to play with patterns. Striped walls are a common feature of gray nurseries, and work well because they have a more subdued, less candy-cane-stripe feel than you’d get from doing the same paint job with almost any other color. But with every tone between black and white at your fingertips, you also have plenty of room to experiment with pattern, contrast, and texture in everything from wallpaper to upholstery to area rugs – without having to worry about your design clashing or looking overly loud or busy. 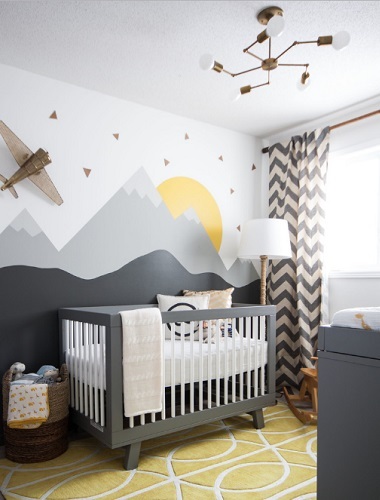 Nurseries often have whimsical animal motifs or even murals, and you might think that a gray color scheme wouldn’t lend well to that kind of fanciful aesthetic. Luckily, a lot of common nursery animals (from cool safari animals like elephants, rhinos, and zebras to more everyday friendly faces like rabbits and birds) look really good in gray. Safari animals in particular make a nice opportunity to add a little touch of still-gender-neutral color to your space, with bright yellow and rusty orange-brown lions, giraffes, and monkeys to round out the look. Last but certainly not least, gray is simply a very soothing color to be around. Like light blue walls, a soft gray can be immensely relaxing while still retaining an elegant, refined feel that you don’t often find in a nursery. While all the parts and pieces of your nursery should, of course, be designed for the comfort and safety of your baby, it’s important to make the space one that you’ll enjoy spending time in as well. The slightly more modern, refined feel that a gray decor can impart on the space can help bridge that gap – soft enough for baby, but grown up enough for you to enjoy, too. This entry was posted in Decorating Ideas and Tips, Latest Trends and tagged gender neutral nursery, gender neutral nursery design, gray nurseries, gray nursery, modern nurseries, nurseries, nursery design.